Top off your engine with a good looking Chrome Air Cleaner Top. These are direct replacements for stock air cleaner tops on small-block and big-block Chevy/GMC V8 cars and trucks with Throttle Body Injection (TBI) systems. These quality tops are stamped from 18-gauge steel and triple chrome-plated for a high-quality finish and great looks. Sealing ring included. Does Edelbrock 1213 fit your vehicle? 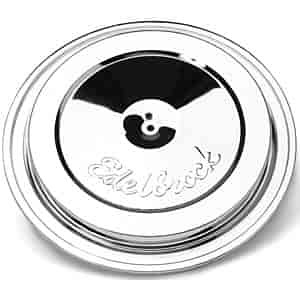 1213 - Edelbrock Chrome Air Cleaner Tops for Throttle Body Injection is rated 5.0 out of 5 by 1. Rated 5 out of 5 by BRC JR from Good quality product Looks great. Fits perfect on the stock air cleaner body.